The Angry Birds weren't content with unleashing their anger in digital form, and have gone analog. Angry Birds isn't just moving from platforms like Android and iOS to the PlayStation Network, it's also pulling a reverse Tron and entering the real world. 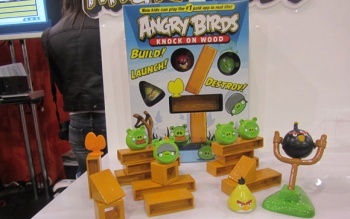 Mattel revealed Angry Birds: Knock on Wood at CES 2011 this week, a board game version of the popular mobile app. In the digital version of Angry Birds, players must fling multiple types of birds at varying structures to retrieve their eggs from evil pigs. Knock on Wood works in a similar way, but with physical representations of the game's characters and building materials. Two to four players take turns choosing mission cards that reveal structures which must be built. One player builds the structure and puts the pig(s) on top, while another must use the included catapult to fling a miniature Angry Bird at it to score points. The first player to accumulate a set amount of points wins. The Knock on Wood box comes with three replica Angry Birds figurines, four pigs, a slingshot launcher, 14 blocks, and 56 mission cards. The birds included are the unibrowed mascot red bird, the speedy yellow bird, and the explosive black bird. No, it doesn't actually explode in real life. I wish more games would follow suit. How about a VVVVVV board game with magnets? Angry Birds: Knock on Wood will be available for $14.99 in May 2011.